In one of my previous articles I've dealt with creating Oracle (Sun) Java 6 packages for your favorite Debian based distro. Since Oracle Java 7 has been out for a while now and it's code has matured to the point of OpenJDK 7 being default in recent Linux distributions, it seems reasonable to upgrade. In this article I'll show you how to create Oracle (Sun) Java JRE and JDK 7 packages using Janusz Dziemidowicz packaging work from Java 7 binary files you have downloaded your self. This entry was posted in Linux and tagged deb, Debian, Java, Java 7, Linux, Linux Mint, Oracle, Sun, Ubuntu on December 5, 2012 by Marko. Different Linux distributions map different fonts to generic font families like serif, sans-serif and monospace and thats fine. Unfortunately as a web developer I need those families consistent on all my machines and as similar as possible to generic font families mapping my code users have. 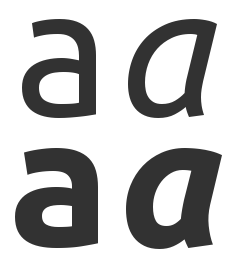 Because of that the first thing I do when I decide to keep Linux distribution around is to configure serif, sans-serif and monospace generic font families mapping. This entry was posted in Web Development and tagged fontconfig, fonts, Linux, monospace, sans, serif, Ubuntu on August 18, 2012 by Marko.